GAO-16-580T: Published: Apr 27, 2016. Publicly Released: Apr 27, 2016. 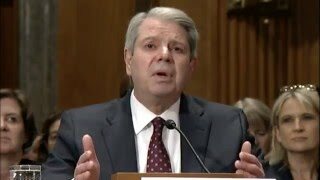 In his April 27, 2016 testimony to the U.S. Senate, Comptroller General Gene Dodaro introduces GAO's 2016 Duplication and Cost Savings Report. GAO's 2016 annual report identifies 92 new actions that Congress and executive branch agencies could take to improve the efficiency and effectiveness of government in 37 areas. GAO identifies 12 areas in which there is evidence of fragmentation, overlap, or duplication. For example, GAO found that the Internal Revenue Service could potentially collect billions of dollars in taxes owed and save resources by better managing fragmentation and overlap, improving communication, and streamlining processes within its nine public referral programs. GAO also identifies 25 areas where opportunities exist to reduce the cost of government operations or enhance revenue collections. For example, GAO found that Medicare could save billions of dollars if Congress were to equalize the rates Medicare pays for certain health care services, which often vary depending on where the service is performed. Congress and executive branch agencies have made progress in addressing the 544 actions government-wide that GAO identified in its past annual reports. As of March 2, 2016, 41 percent of these actions were addressed, 34 percent were partially addressed, and 20 percent were not addressed. Congressional and executive branch efforts to address these actions over the past 5 years have resulted in roughly $56 billion in financial benefits, with at least an additional $69 billion in estimated benefits projected to be accrued through 2025. These estimates are based on a variety of sources that considered different time periods, assumptions, and methodologies. Note: The total percentage does not add to 100 due to rounding. While Congress and executive branch agencies have made progress toward addressing the actions GAO has identified, further steps are needed to fully address the remaining actions. GAO estimates that tens of billions of additional dollars would be saved should Congress and executive branch agencies fully address actions that are currently partially addressed or not addressed, including the new actions GAO identified in 2016. A substantial number of GAO's actions from the 2011-2016 annual reports fall within the areas of health care, defense, and revenues, and these areas have significant opportunities for cost savings or other financial benefits. For example, in the 2015 annual report, GAO reported that DOD could potentially achieve hundreds of millions of dollars in cost savings by re-evaluating its headquarters reductions efforts and conducting periodic reassessments of workforce requirements. The federal government continues to face an unsustainable long-term fiscal path based on the imbalance between federal revenue and spending. As the fiscal pressures facing the government continue, so too does the need for the Congress and executive branch agencies to improve the efficiency and effectiveness of government programs and activities. Such opportunities exist throughout government. To bring these opportunities to light, Congress included a provision in statute for GAO to annually identify federal programs, agencies, offices, and initiatives (both within departments and government-wide) that are duplicative. As part of this work, GAO also identifies areas that are fragmented or overlapping as well as additional opportunities to achieve cost savings or enhanced revenue collection. GAO's 2016 annual report is its sixth in this series ( GAO-16-375SP ). opportunities to achieve significant benefits from selected areas included in this year's and past annual reports. To identify what actions exist to address these issues and take advantage of opportunities for cost savings and enhanced revenues, GAO reviewed and updated prior work, including recommendations for executive action and matters for congressional consideration. For more information, contact Orice Williams Brown at 202-512-8678 orwilliamso@gao.gov or A. Nicole Clowers at clowersa@gao.gov or (202) 512-7114.